How do I load Models, Motion, and Music data files in MikuMikuDance? How do I load motion data in MMD? How do I use the Reverse button? How to load models in MMD directX 9. How do I get started with MMD? When you first loaded MMD into your system and you opened it all you saw was a rather intimidating interface and a rather bleak grid (By the way, this grid is the display panel). First of all: Don’t Panic. If you’ve downloaded the DirectX9 version and you speak English-then you’re in luck! The main menu options are in English. (Note: The instructions in all my articles refer to the DirectX versions program). First, the bad news, MMD does not give you any music files (.wav) and you cannot use any other music formats in MMD. Secondly, you don’t get any motion data (.vmd) files. The only files you can immediately open are the sample files and loading the models. Now, before you start thinking you got ripped off, you have to remember that this is freeware. All the videos you have seen to date have started from this very point. So take heart you’re in good company and again: Don’t Panic. Now the good news, there are all kinds of sites where you can get these model,motion and music files. YouTube, DeviantArt, and mikudance.info are probably the most popular and familiar. Just type into your favorite browser the name of the song and .wav and or motion data and all kinds of options will be available to you. You should use WinRAR or 7Zip; both can be downloaded for free at cnet.com (http://download.cnet.com/windows/?tag=hdr). I use WinRAR (I do a LOT of downloading). Use whatever you’re most comfortable using. You should also take this time to organize your folders (models in the models folder; motion data into the motions folder; music in the Wave). A good habit to establish early on, is to document who made the data you are downloading. Please give credit where credit is due. 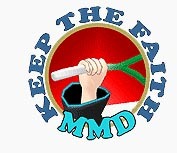 You don’t want to start off your MMD experience as a leech! Let’s load a model. You can do this right away, without any downloading. First, go to the Model Manipulation panel and click load. A window will open up and allow you to choose your model. Your options are 11 models, a bunch of eye files, some graphic files, and a Dammy Bone (This is actually called the Dummy Bone (Something was definitely lost in the translation). Please go the other articles in this site for more information regarding the Dummy Bone). Now pick your model and load it up. Once you’ve downloaded some .wav files. Here’s how you load music data: Click on the file option of the main menu and select load WAV file. Select the file you want and it will load up. You will see some graph lines in the white field below the Frame Manipulation Panel. Unless, there is an awfully long silence before the actual music starts. How to Load Motion Data. In the “Extra” section below I hope you download some .vmd files. Here’s how you load motion files. At the main menu bar; click on file; select load motion data. The motion data’s window will open up and you can click on the appropriate .vmd file for your .wav file. Now press play in the grey play panel. and watch your model sing and dance. If you have WinRAR or 7Zip go there and download them. These 9 Bundle Packs contain motion, wave, and camera motion files! After you have dl’ed them; separate them into their coordinating MMD files (Trust me and take the time to do this. It will save you hours of wasted time later). Right above that, is a source for some of her stages. Some of the stage links have been taken down, by the way, but not all of them (She has designed some very popular stages). She has done a great service to the newbie MMDer. Don’t forget to mind your manners: thank her. Thank you for your help, I’ll try this out, I hope it will help. Hello, once i saved motion data, everything was saved for every model. Today i wanted to continue making animation but when i load a motion for a model it says ¨This is not Vocaloid Motion Data file¨ though it is. Please, can you help me fixing this? I’ve worked a lot at this and now it gives me that message. Thank you. Are you sure you’ve loaded it correctly? Every data file type has its own menu command or a control panel button to load. If you saved the whole project using the “file->save” or “file->save as” command, you get a .pmm/.emm files pair having information about all models and stages you used at once, and it has to be loaded by “file->open”. .VMD files are individual model motion files, and they have to be saved by a different process, “file->save motion data”, for each model separately. It normally doesn’t make sense to do it for your own project, unless you plan to publish and distribute motions created by you (or otherwise reuse them, but let’s keep things simple for beginners). I suspect that you saved your work as a .pmm, and therefore as a .pmm it has to be loaded. I’ve been using mmd for quite a long time and I was saving each model motions in case I need to continue an animation or reuse them. I have never had a problem with loading a motion data onto a model, but yesterday I needed to continue and I had this problem, though a camera’s motion data can be uploaded, but for models “This is not vocaloid motion data file”. I tried earlier versions of mmd, doesn’t seem to work too. I was thinking about converting vmd files, might work, but I’m not really sure. Is there any possibility to make it work actually or I could just give up on that and remake everything? Hmm, can you upload those files somewhere for me to take a look? I’ll try to upload it soon. I’ll send a reply when it’s done. Got to look at the file through editplus, no information inside – empty, I guess the file is corrupted by unknown reason. So I guess there’s no way to fix that. Yes, I’m afraid that’s the case. Well, you may yet try to right-click it, select Properties=>Previous Versions, and see if Windows has a fail-safe for you. On some configurations, it may help. There are two kinds of people: those who make backups, and those who don’t do it *yet*. In case you mean an accessory .x file, then yes, there’s a way. Load PMXE and select File->Import (or just drag’n’drop the file onto a PMXE window and select New), then save it as a regular .pmx file. I`ve downloaded a “Follow The Leader” vmd file and have been trying to load it the way you said I should, but it says it`s not a vmd file. Even it it clearly says it`s a vmd file. Someone tell me what I should do. Hello! … A VMD file can be for Camera motion or for Model motion. Be in Camera mode, or have the model selected, before you apply the appropriate VMD file. Whenever I try to load a .pmx model, is’t completely white. Is it something I did? Did you unpack texture files into the same folder where the.pmx model is? I just did and now I feel kinda dumb. Um hello I’ve encountered a problem. When I play the motion it’s oddly slow and doesn’t match the wav file, is it my computer or mmd? the other times I used mmd, it has seen perfectly fine but now the model moves slow and won’t play in sync with the character. Describe “the other times” and “now”. Did it start to happen after certain time to any motion at all, or does it happen to some motions but not others? Try to select “File->play WAV with frame” command and move the time with left and right arrows. Does the motion match the audio this way? I figured out the problem. I had multiple things open and since mmd take 100% of the mmd power it seemed to affect the motion. So I just need to turn on low pow for now on when I have multiple things open. If you do a Render to AVI… in that video, does the motion match the music… does the animation move at the proper speed in the video? Helloo, so I got MMD recently, and I’m still grasping the basics. How do I load in a stage? I don’t mean a background picture, but an actual stage. It depends on the type. Some are .x files, like the default stage in your download. You load this via the Accessory Manipulation Tab. Others comes in .pmd/.pmx type, such as the stage available from our download page. You’ll need to load this like any other normal models via the Model Manipulation Tab. Some even has multiple parts and mix both .x and .pmd types to create one huge stage like a city. You’ll need to load those accordingly. Hope that helps! I DLed a motion file but it’s not really a .vmd file. It’s an .rar file and I need to convert it back to a .vmd file, how can I do it? .rar file is an archive, a compressed package that takes a lot less HD space (and traffic, when downloaded) than the bunch of files it consists of. You have to unpack its contents before using. There are several archivator programs on the market, but for MMD-specific reasons I’d recommend Bandizip (it’s free). KB… very patient of you “:o). That’s a heavy blow, but MMD will cope with this loss. I am doing everything the post here says, but when I want to load the motion data, .the program says that ‘this motion file has no camera/light/shadow data.’. Except I loaded the camera,light,shadow data that was in the same folder and it works. The camera zooms in and light changes work but the motion file itself doesn’t respond. When you load the motion data, exactly the model that you want the motion applied to should be selected in the model manipulation panel, and the model mode (not the camera mode) should be selected. hey, how do i download motion data? when i downloaded WAVE motion data (the new version) i converted it and then when i tried to load on to my luka model, it would not work. can someone help me? A motion data file is a .vmd file… So you downloaded the motion, unzipped the folder… and now have that .vmd file in the new folder… yes? Than you open MMD and load your Luka model. Then you go to the File tab and choose Load Motion Data… you navigate to and select that .vmd file… yes? … And Luka doesn’t snap into the frame-zero position? There’s more than one potential reason for this occurring. In my experience, the most frequent cause is broken physics, and that’s the first thing that I would rule out. Make a copy of your model and delete all rigid bodies and all joints, then try loading it. Does it still crash? Okay, i do everything you say, and NOTHING HAPPENS..
What kind of “nothing”… what did you try to do… what did you click? …and what happened? Probably because MMD doesn’t know how long your animation is … you gotta tell it by entering a number of frames under the PLAY button … 0 – 1200, or whatever.